"He faces stiff opposition from other islamists, liberals, former regime members.."
"He's a back-up candidate who lacks charisma"
But they can only comment and criticize and opine. Allah gives victory to whomever He wills, and try as much as we like, we human beings have no power except by Allah. He was the one who willed for a country to be ruled by iron-fisted dictators for over 50 years. Why? Only He knows why, we can only, at best, make educated guesses. My guess is that this long period of repression was a training ground. Heat and pressure turns coals into diamonds. "Become slaves before you become leaders"
That long period of repression and imprisonment was a test. To see who would be sincere in the face of hardships. To separate the black dirt from the white flour. To make them humble. Because only humble leaders can have empathy with the poor, the weak, the downtrodden. 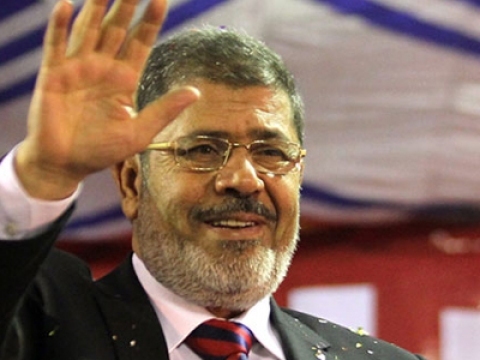 May Allah be with you, Dr. Morsi. insyaAllah.. may Allah blesses him and us..